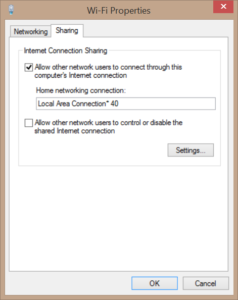 netsh wlan connect name=%HOST_NETWORK_PROFILE% interface="Wi-Fi 2"
You can find the %HOST_NETWORK_PROFILE% name by entering netsh wlan show profile in a CMD window. On first use a new network interface is created. you can see its name on the network adapter page in the control panel: Control Panel\Network and Internet\Network Connections. Mine was named "Local Area Connection* 40". Now you have to share the Internet connection from your second adapter to this interface . 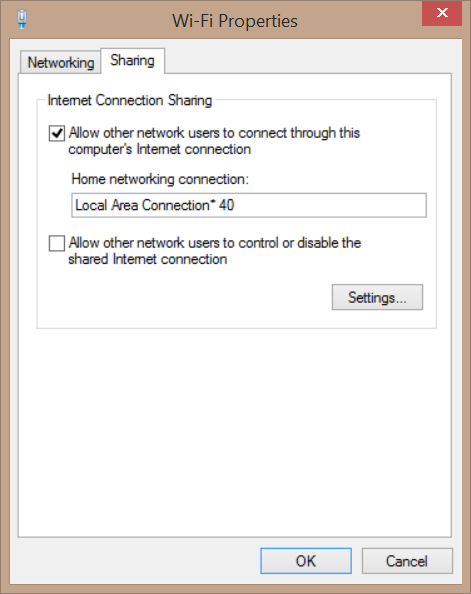 To do this, right click "Wi-Fi 2", select Properties an go to the Sharing tab. Change the settings like this: That's all.